I know I'm late for the party but better late than never, right? A recent study sequenced three hunter-gatherer genomes from Georgia and one from Switzerland, expanding our understanding of the pre-Neolithic genetic landscape of West Eurasia. Figure 1: Genetic structure of ancient Europe. (a). Principal component analysis. Ancient data from Bichon, Kotias and Satsurblia genomes were projected11 onto the first two principal components defined by selected Eurasians from the Human Origins data set1. The percentage of variance explained by each component accompanies the titles of the axes. For context we included data from published Eurasian ancient genomes sampled from the Late Pleistocene and Holocene where at least 200 000 SNPs were called1, 2, 3, 4, 5, 6, 7, 9 (Supplementary Table 1). 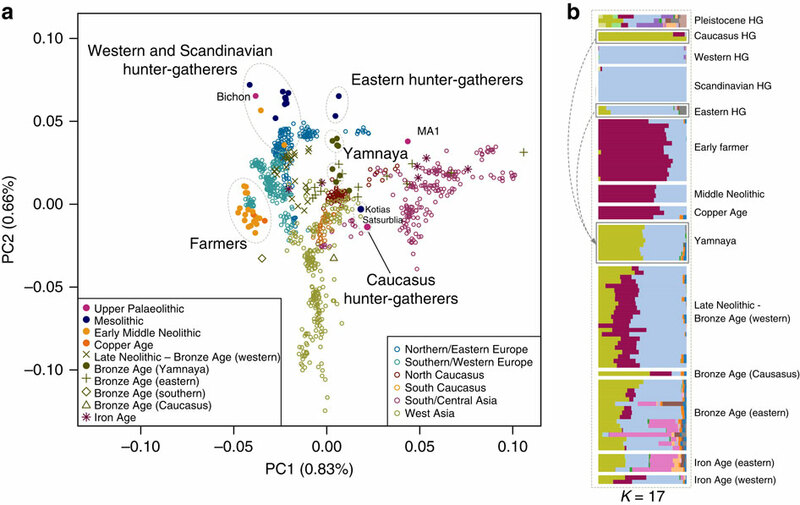 Among ancients, the early farmer and western hunter-gatherer (including Bichon) clusters are clearly identifiable, and the influence of ancient north Eurasians is discernible in the separation of eastern hunter-gatherers and the Upper Palaeolithic Siberian sample MA1. The two Caucasus hunter-gatherers occupy a distinct region of the plot suggesting a Eurasian lineage distinct from previously described ancestral components. The Yamnaya are located in an intermediate position between CHG and EHG. (b). ADMIXTURE ancestry components12 for ancient genomes (K=17) showing a CHG component (Kotias, Satsurblia) which also segregates in in the Yamnaya and later European populations. The Swiss one (Bichon, Jura) is maybe less of a novelty, roughly falling within the already known parameters for Western European hunter-gatherers of Magdalenian tradition (WHG in the jargon) but the three samples from the Caucasus (CHG) are really a much needed new data-point, different from everything else that what we knew and surprisingly close to modern Caucasus populations. They are however very distant from all other known ancient West Eurasian samples. Fig. 2 shows an estimated divergence with early Neolithic Europeans (EEF, Stuttgart) dating from before the Last Glacial Maximum, to 24,000 years ago. The divergence of this composite West Asian macro-population (EEF's Paleoeuropean admixture is accounted for separately) with the pre-Neolithic Europeans seems to be of c. 46,000 years, what is consistent with early Upper Paleolithic (the large error margin allows for a secondary Gravettian genesis contact anyhow). On the other hand the divergence between Bichon and Lochsbour seems to fit with the Magdalenian time-frame as one would expect. CHG are surprisingly close to modern Caucasus population, particularly to Georgians. CHG also appear to be an excellent candidate population for the formation of the early Indoeuropean Yamna people, which fit best as a mix of CHG and EHG (Eastern European hunter-gatherers). Figure 4: The relationship of Caucasus hunter-gatherers to modern populations. a). 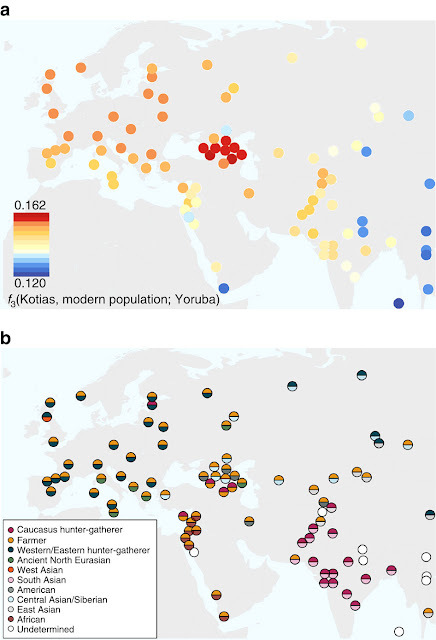 Genomic affinity of modern populations1 to Kotias, quantified by the outgroup f3-statistics of the form f3(Kotias, modern population; Yoruba). Kotias shares the most genetic drift with populations from the Caucasus with high values also found for northern Europe and central Asia. (b). Sources of admixture into modern populations: semicircles indicate those that provide the most negative outgroup f3 statistic for that population. Populations for which a significantly negative statistic could not be determined are marked in white. Populations for which the ancient Caucasus genomes are best ancestral approximations include those of the Southern Caucasus and interestingly, South and Central Asia. 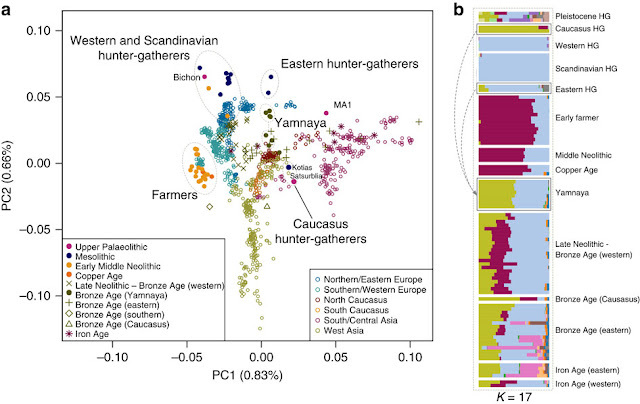 Western Europe tends to be a mix of early farmers and western/eastern hunter-gatherers while Middle Eastern genomes are described as a mix of early farmers and Africans. I find notable that the CHG component (do not confuse with the African one of similar color) is still apparent in the Indian subcontinent, something that was already detected in other analyses. The CHG component seems to be the core of the so called "ancient North Indian" (ANI) component, also known as "Gedrosian" or "Caucaso-Baloch". What they call in the above analysis "South Asian" would be approximately the also known as "ancient South Indian" (ASI) component, which is presumably pre-Neolithic. "Farmer" means European Early Farmer (EEF) and already implies some Paleolithic European admixture, until we have some Levant and Mesopotamian genuine first Neolithic samples, we should not assume that all the Fertile Crescent Neolithic people were just like that, although some may have been close. In fact, I tend to think that the CHG or a similar "highlander" component was probably important in the Zagros Neolithic and consequently in the Mesopotamian and Iranian one, reaching eventually to South Asia. See here for more details on how the Neolithic expansion in Europe and India were largely parallel but not identical at all in source populations. I strongly recommend to read the full source study, because it is very informative about what were some of our ancestors¹ doing when farming and herding were being developed in West Asia, but the map above alone gives a very good glimpse of the ethno-cultural complexity of these ancient West Asian populations. My understading is that the mainline (Thessalian or Aegean) European Neolithic founders must have originated within the PPNA/B complex, although uncertain about which specific culture within it (most likely not Harifian because that one is surely at the origin of Semitic languages but almost any other one would do, notably those close to the Mediterranean coast: Sultanian, Aswadian and Mureybetian). Instead the populations affecting Eastern European, Mesopotamian-Iranian (Sumer and Elam) and Indian Neolithic are most probably rather linked to what is here called as M'lafatian or Zagros Neolithic, which in turn were most likely linked one way or the other to Caucasus hunter-gatherers and in general to the "highlander" West Asian element apparent in other studies in contrast to a more EEF-like "lowlander" one. ¹ Sure: I'm thinking mostly of Euro-Mediterranean and Central-South Asian peoples but even if you are East Asian or Tropical African it's still very probable that some random ancestor comes from this crucial paleo-historical knot (or almost from anywhere else: admixture never ends and we are all related, even if thinly, within the last millennium or so). Luis, Impressive post. I tend to think that CHG surely has some regional substructures, only aDNA from further East will be able to determine that. And welcome back!, I am pretty sure this going to be a massive massive year!. 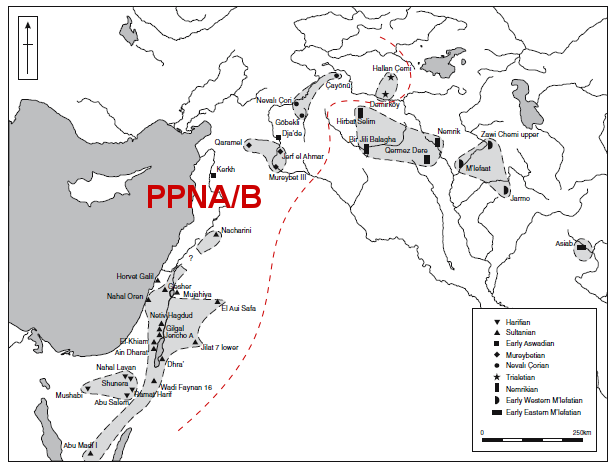 "My understading is that the mainline (Thessalian or Aegean) European Neolithic founders must have originated within the PPNA/B complex"
If you're implying that PPNA/B occurred first in the Levant, rather than the Aegean, Anatolia and Greece, then I would say that this is *not* what "they" are finding. What is distinct about these early Aegean Neolithic sites (today Greek and Bulgarian) is that gravettes are found. They are very clearly epi-gravettian in context. You can google for a map of where epi-gravettian sites have been found. Epi-gravettian sites are common in the southwest, central, and southern regions of the East European Plain c. 17,000-10,000 years BP, are present in the Crimea and Northern Caucasus, and are also found in Italy, the Balkans and Southern France. The persistence of late gravettian sites at the cusp of the Neolithic is a current area of focus within archaeology. That study you mention I did go through in a previous entry, following one you made, Marnie. However my reading is that it favors a coastal migration (versus the inland migration model of Ozdogan), followed by interaction across the Aegean between the two resulting populations (only one of which would be involved in the mainline European Neolithic: the "Greek" one, as we can infer from the sharp cultural boundary some time later between the Thrace and Marmara populations). 1. The Fertile Crescent Neolithic (with its complexity and diversity) is significantly older than anything similar in Europe or South Asia. 2. Early Neolithic in Europe and South Asia arrived with the biological "Neolithic package" (crops and cattle) but without pottery. 3. The early European farmers (EEF) clearly tend, very strongly, in the autosomal and haploid genetic aspects, to West Asia. The details about what part of West Asia are more debatable but it is West Asia in any case - and very very probably the Neolithic Levant more specifically. In addition to that West Asian immigration, there was some admixture with local Paleoeuropeans, akin to WHG (or maybe EHG but without the ANE element), admixture that increased as the moved West but not in a purely regular way (there are hotspots of admixture, notably the Atlantic). The issue of lithic technologies being Paleoeuropean often, not just in Greece, but also along all the Mediterranean expansion area (Impressed-Cardium Pottery culture), is something that has fed the debates since long ago, supporting apparently cultural diffusion and contradicting the settlement models, however the genetic data we now have does not support a mere "cultural diffusion" scheme but rather a "mestizaje" one. Apparently the immigrants did not have much to offer in terms of lithic techs, although they did carry key "technology": domesticates and probably also good boats. Also we must consider that different sites surely had different histories: it's not the same Sesklo that Franchthi: the first one appears to be a colony, while the latter looks rather a local population adapting to the new times. One thing you may want to consider here is that the Epipaleolithic sites are concentrated towards the Peloponese, while the Neolithic ones are rather found in Thessaly and West Macedonia. As for Epigravettian, this is a very generic term and we should at least consider two groups: the Italo-Adriatic one (including the only known Epigravettian site in France, which is right near Italy) and the Eastern European one (including the Low Danube regions). I'm not sure to which one these EP Greek populations belonged to but I'm tempted to lean for an Italian affiliation based on on the WHG-like affiliation (without "ANE") of the EEF Paleoeuropean component. Reingruber paper does not favor a coastal only migration route. In fact, it expressly questions the notion of a migration route. Fertile Crescent Neolithic is not the epicenter for Neolithic expansion into Europe. Epicenter for Neolithic expansion into Europe is Aegean/Anatolia, as supported by numerous papers in genetics and archaeology. "One thing you may want to consider here is that the Epipaleolithic sites are concentrated towards the Peloponese, while the Neolithic ones are rather found in Thessaly and West Macedonia." The major site of Klithi is epigravettian. It is in the Vikos Gorge, in Epiros, just east of Western Greek Macedonia. There are also sites in Croatia which are classified as late epigravettian. "Epicenter for Neolithic expansion into Europe is Aegean/Anatolia, as supported by numerous papers in genetics and archaeology". Rather Aegean/Thessaly. I see nothing particularly "Anatolian" in all this process. But that's the epicenter once they already reached Europe (Greece). What about before? I'm of the opinion that it implied a coastal migration from the Levant, the archaeo-genetic data particularly supports that idea, the archaeology is not at all against it either. "Rather Aegean/Thessaly. I see nothing particularly "Anatolian" in all this process. But that's the epicenter once they already reached Europe (Greece). " Again, see Reingruber paper. And not just Reingruber. I can give you a list of other authors that are looking at this, if you're interested. Don't just list authors. I've read the Reigruber paper, so if I missed something important feel free to point me to the exact paragraph or figure. I don't have time for searches and it's much easier for me to assume that you lack of a proper argumentation than to re-read the paper looking for who-knows what "evidence" you seem to find in it. Be specific, please. OK. I'll put up some quotes from Reingruber and some of the other Neolithic papers I've been reading in the last six months or so. It'll take me a few days to reread the necessary papers, but I'll make a point of doing it. Note: "Anatolia and the Near East have long been recognized as the epicenter of the Neolithic expansion through archaeological evidence." So, if Anatolia and the Near East are the long recognized epi-centers of Neolithic expansion, why do we continuously hear in the press that it is the "Middle East" that was the epicenter from which the Neolithic expanded? "Anatolia’s central geographic location appears to have served as a connecting point, allowing a complex contact network with other areas of the Near East and Europe throughout, and after, the Neolithic." Gee, do you think this complex contact network between the Near East, Anatolia and Europe suddenly emerged in the Neolithic? How magical that would be, especially given this paper, Jones et al. shows that European/Siberian/Caucasus populations largely stem from similar Upper Paleolithic populations. They were interacting and trading, intermarrying, and probably even traversing the Mediterranean, well before the Neolithic. All this focus on the Neolithic, and the notion that there are distinct populations such as the "teal people" is absolute junk, from a scientific and medical perspective. Yes, ecozone specific specialization, which is evident from the archaeological record. And yes, there is some differentiation visible with Admixture. However, in the large scheme of things, these populations were very similar (Georgian, Basque, Sardinian, Balkan, Motala, Magdalenian). I strongly doubt that any of these populations had anything so distinct as blue only or brown only eye color. Same for hair color. It's absolutely appalling that paid professional researchers are perpetuating these simplistic and harmful ideas. Even if we don't have that study, we can use the also West Anatolian early Neolithic reference of Mathieson, which shows the same pattern of some but less Paleoeuropean admixture than EEFs. This may have been caused by interactions across the Aegean after Neolithic settlement or by (undocumented) previous Paleoeuropean settlement in West Anatolia. In any case what we get is that both sides of the Early Neolithic Aegean had, very roughly, a similar genetic pool of some Paleoeuropean admixture on a presumably Levantine immigrant base. Anatolia Peninsula (geographically understood and not in the twisted Turko-centric political sense that also includes Upper Mesopotamia) is NOT a major center of Neolithic expansion. At least it is not clear what role it may have played. Before this expansion to the Aegean, only a few sites in the area of Çatalhöyuk are known and these don't seem to be particularly related to the expansion westward along the coast. Anatolia is not that important. Another story is of course Upper Mesopotamia or Kurdistan but that's not Anatolia. Anatolia proper was a destination and not an origin, except possibly for cow domestication, which happened relatively late and may well be from the Çatalhöyuk or SE Anatolian area. ... "why do we continuously hear in the press that it is the "Middle East" that was the epicenter from which the Neolithic expanded?" I don't know what "Middle East" means for you but for me it is indistinct from "Near East" and "West Asia". These "East" and "Orient" terms are Eurocentrically sloppy and that's why I use "West Asia" almost invariably, because there is a consensus on what it means. Fertile Crescent would do as well. "Gee, do you think this complex contact network between the Near East, Anatolia and Europe suddenly emerged in the Neolithic?" I don't think we can yet talk of "complex network" in the Early Neolithic. Rather an avant-guard population was in search of new lands and got lucky. Their main asset seems to have been mariner skills, and that's (among other reasons) why I think that Cyprus (rather than Anatolia but without excluding coastal interactions) played a key part. There was a second wave later on that is more specifically Anatolian (in fact Halafian, so again rather Upper Mesopotamian but looks more related to Anatolia than the first one). The impact of this one was limited to some regions of the Balcans (Vinca-Dimini culture). The "networks" were anyhow forged along time and much of them was anyhow still via the sea, as when we see a back-flow of Cardium style pottery fad towards Lebanon (again not affecting Anatolia). Anatolia is rugged and semi-arid, without great rivers, so not the ideal terrain for "networks" in fact, unless they go along the coast. While much of the archaeology is still unknown (partly because of the erosion affecting the plateau) I strongly doubt major sustained interactions before the Bronze Age, excepting the already mentioned unidirectional migratory waves, which can't be described as "networks" between Europe and Asia. "They were interacting and trading, intermarrying, and probably even traversing the Mediterranean, well before the Neolithic". Probably not. If that would be the case, we'd see very early colonization of islands like Crete and Cyprus and we do not. Navigation was limited and inland transit probably too to some extent (even if there was an isthmus in the Ice Age, it was narrow, also the arid Central Anatolian plateau acts as second barrier). Genetics also seems to support a long sustained separation of Paleolithic West Asians and Europeans, dating to either Gravettian or Aurignacian times. "I strongly doubt that any of these populations had anything so distinct as blue only or brown only eye color. Same for hair color". I also doubt it but there could be some fixation tendencies. Not my main interest anyhow. West who packed them (according to view [A] in the introduction), or were any local populations involved in the process, who adopted only parts of it, leaving certain features and contents aside (according to view [B] in the introduction)? Or instead, is the ‘Package’ rather the result of a combination of two processes: mobile groups of people relying increasingly on domesticates (with all the consequences involved), and influencing other mobile groups of hunter-gatherer-fishermen through regular contacts and exchanges in such a way that the latter groups also adopted and became adapted to innovations, and to social and cultural change?" So, in fact, Reingruber doesn't argue specifically for a coastal route. She's putting the questions out there, and arguing for a more data driven approach to understanding the Neolithic. "Navigation was limited and inland transit probably too to some extent (even if there was an isthmus in the Ice Age, it was narrow, also the arid Central Anatolian plateau acts as second barrier). " No. They were mining obsidian off of the island of Melos in 10,000 BC. They had mastery of boats before the Neolithic. But they (or related groups) also commanded the highlands, as, for instance, is shown by recent publications of Paolo Biagi. It is really not difficult to imagine this, as you can easily walk from Thessaly, cross the Grevena highlands then the Samarina pass, and arrive in Epiros and Corfu in a matter of days. "Genetics also seems to support a long sustained separation of Paleolithic West Asians and Europeans, dating to either Gravettian or Aurignacian times." But these distributions are likely due to ecozone/hunting specialization, rather than some fundamental inability to cross geographic barriers. Native Americans also exploited specific game ecozones, and their well understood traditional borders can be traced back to this type of regionalization. "I don't think we can yet talk of "complex network" in the Early Neolithic. Rather an avant-guard population was in search of new lands and got lucky." Umm. I don't think so. The only reason that there isn't more data on the highland Mesolithic in the Balkans is that it has been understudied and also sublimated by researchers who vehemently insist on the denying that there is continuity between the Balkand Mesolithic and the Balkan Neolithic. Same for Italy, including Sicily. Clive Bonsall, for instance, laughably has said that the Balkan highlands were not habitable during the Mesolithic/Neolithic transition because there was not enough water. Has he even been there? "I strongly doubt major sustained interactions before the Bronze Age, excepting the already mentioned unidirectional migratory waves, which can't be described as "networks" between Europe and Asia. " The evidence supports trade networks, even during the Mesolithic.
" only a few sites in the area of Çatalhöyuk are known and these don't seem to be particularly related to the expansion westward along the coast. Anatolia is not that important." "Reingruber doesn't argue specifically for a coastal route". She does mention that the key "stepping stone" of the Lakes region was first colonized at the coast, which is consistent with the coastal hypothesis and inconsistent with an inland migration. All the groups she studies in Western Anatolia have a coastal orientation anyhow, quite unlike Southern Anatolian Early Neolithic, which is quite inlander. "They were mining obsidian off of the island of Melos in 10,000 BC. They had mastery of boats before the Neolithic". Sure. There's also a pre-Neolithic colonization of Sardinia and another one of Cyprus. I don't deny some Epipaleolithic serious navigation, including maybe Italy-Greece crossings. But the real mariner stuff in Europe and the Mediterranean begins with this trans-Aegean migration, after probably a coastal route along southern Anatolia, and the subsequent Cardium Pottery deep sea fishing evidence, along with rapid coastal expansion westward. So there's an extra mariner development with Neolithic that I don't think can be simply assimilated to the more limited scope of Epipaleolithic navigation. "... these distributions are likely due to ecozone/hunting specialization, rather than some fundamental inability to cross geographic barriers". I was not implying any absolute "inability" but the barriers help to keep the boundaries put, the rest is done by people defending their hunting grounds or ethnic territory. Individuals and even groups may cross successfully such boundaries but it was rare enough not to have a significant impact. I don't think ecology is so important in most cases: there's no big difference between Syria, Greece and Andalusia but these originally hosted three different populations - only the Neolithic expansion erased, to an extent, the differences. Even today we can see how Andalusians are more related to Norwegians than to Syrians, let alone nearby Moroccans. Other factors than ecology are at least as important if not more. But Na-Dené spread from Alaska to Arizona, not from Alaska to Greenland as your ecozone hypothesis seems to imply. Things are not as simple. Are you implictly claiming that Italo-Greek Epigravettian peoples were as strikingly distinct from WHG and EHG as to be much closer to West Asians genetically? It makes no sense whatsoever to me, although we lack of the archaeogenetic data to prove it conclusively. Basically you're saying that there was a Gravettian people that, in spite of living in Europe, were most closely related to West Asian peoples. This seems contradictory with fig. 2 of the paper discussed here, among other data. "Clive Bonsall, for instance, laughably has said that the Balkan highlands were not habitable during the Mesolithic/Neolithic transition because there was not enough water. Has he even been there?" That sounds like nonsense but it is true AFAIK that low density regions like North Franc and most of the Balcans were characterized in the Pleistocene (not in the Holocene) by dry steppe conditions not too conductive to settlement. Of course the Danube and its affluents were there all the time, with more or less water, so it must be taken with a grain of salt, but in any case the Balcans look as a rather low density region, even today but more clearly in Paleolithic contexts. "The evidence supports trade networks, even during the Mesolithic". Through inland Anatolia? Across long distances? What evidence? I'll respond in detail in the next few days. Hi, Maju have you seen this yet? No, I had not seen it. But it's only a conference abstract, so I never know what to do with that kind of stuff. Anyhow, I'm not surprised by the conclusion. I would imagine at least 2 distinct Fertile Crescent early Neolithic populations, one centered in the Levant (comparable to the EEF but without the paleoeuropean fraction, rich in "Arab" component, G2a, E1b-M78, etc.) and another one centered in the Zagros (comparable to what arrived to Russia and Greater India, probably rich in R1a1, J2 and the "Caucasus-Baloch" component). However J2 probably was also present in the Levant population, at least the northern subset, while the southern subset would be richer in J1 instead. It would be very nice to know how exactly were the various subpopulations and if these predictions of mine are accurate or not or just somewhat. Today we know CHG is essentially Iranian Neolithic with a smaller amount of EHG. Yet, many authors still treat CHG as it is genetically unique. a distinct group? That is bad even for 2016 standards. It's obvious that iranians are ancestral to the vast majority of chg samples represented in ancient DNA studies. They are nearly autosomal equivalent, with chg with a slightly higher ehg influence....even there haplogrouos come from iranian plateau. Wasn't there an issue with the CHG sample being extreme in its "Basal Eurasianness" tendency? I think that's why it's treated separately and Iran-Neolithic preferred as likely source instead. But the same overall idea anyhow: it's the "Caucasus" component that has come once and again since Admixture-like analysis became a thing and that is closely related to the "Baloch" (sometimes "Gedrosia", "ANI") component further East, representing the "Eastern branch" of West Asian Neolithic quite clearly. It seems as with a few of these recent studies, CHG being 'older' than Iranian Neolithic is merely a tautological point; Simply taking an 11Kbp Caucaus sample and calling it 'CHG', and taking a 9kbp Iranian sample and calling 'Iranian Neolithic'. But the fact that the two groups share a significant amount of genetic data, does not prove your older sample contributed to the genome of your later sample. Unless you have Iranian samples from the same period time period, it doesn't make sense to draw any such conclusion about the direction of genetic influence. And it would certainly be nice to have more than 2 samples for CHG.
That being said, we can take a clue from the prescence of Haplogroups in the two 'CHG' samples, both which were J bearers. It has regularly been considered, for some time now, that Haplogroup JM410 is a near eastern haplogroup. This is in line with the fact that IJ Linker has been found around Iranians - not any CHG group of any time period. And J* only to the South of the Caucaus. J2-m172 is frequent in Iran, and the oldest J2a-410, to date has been assigned to an individual who live in Hotu Cave in northern Iran, dating from 9100-8600 BCE (Lazaridis et al. 2016). This is compared to the earliest J2a assigned to the Caucaus sample; Kotias Klde in Georgia, dating from 7940-7600 BCE (Jones et al. (2015)). J2 diversity, in general, is certainly greater in Iran over the Caucaus. If one observes the admixture proportions https://ibb.co/b7Z29f, it can be seen the Iranians have a small, but significant, secondary 'yellow' component, 'purple' and a 'maroon' component, which apparently the CHG samples are both bearing, in some proportion, as well. (And although the amount is minute, it is highly significant, considering the low amount which is, otherwise, exclusive to Iranians). This very well may be taken as evidence of the hypothesis that CHG was a product of Iranians sometime in the upper paleolithic to early neolithic period. The Iranian archaeological record is impeccable. There has been a gradual transition in the agricultural phase from the upper paleolithic to the neolithic agriculturist. To say obscure hunter gatherer settled and replaced the genotype of an already highly populated Iranian plateau, is more specious than viable. But the issue of having, apparently, more load of a ghost component that has been called "Basal Eurasian" (or I sometimes call quasi-African, because it's something betwen Yoruba and mainstream Eurasian but we don't really know for sure if it is African, Asian or both) makes it not "older" but DIFFERENT. And it seems for what I've seen here and there that the population that influenced genetically the early Indoeuropeans was not that much loaded with "Basal Eurasian". If I said "CHG is older" it'd be indeed as you say a tautology, but it's not just older it's different in that detail, which could be indicative of Iran-Neolithic and not Caucasus Hunter-Gatherers the partial source population at the Indoeuropean genesis (the other part is EHG, i.e. WHG+ANE, "Siberianized Paleoeuropeans" from the Eastern and Northern fringes of the continent). I fully agree with Y-DNA J being restricted to West Asia (and maybe Northeast Africa?) until at least the Neolithic. But we should consider the Caucasus region as part of West Asia, as it is today per its genetics, even the parts technically in Europe. As for the yellow element in ancient Iranian samples, it's clear that it indicates some admixture not present in the Eurasian steppe but that can just suggest a third unstudied population that had not that admixture but was otherwise closer to Iran-Neolithic than to CHG in that lower load of "Basal Eurasian". We can't expect to be lucky enough to have sampled all the key populations, there's always blanks and lacunes in our knowledge. Anyhow, in fig. 2, from which you take your detail image, we see that neither the yellow, nor the purple nor the light blue components have any reference population. To my eyes they look just some sort of "noise". I would take a look to the supp. materials to see if there is a more extended Admixture analysis, because those three components seem suspect of being artifacts, minor deviations of each of the populations because of their own genetic isolation or something like that, not really significant probably. Yes, the more I look at it that graph is probably best understood at K=3, with three components: Paleoeuropean dark blue, Proto-Vasconic or Neoeuropean orange, and Zagros-Caucasus Green. And even then it can be confusing because the Proto-Vasconic or Anatolian Neolithic population was found in previous studies to be mostly a mix of Iran/Zagros Neolithic and Palestine/Levant Neolithic, with a very slight touch of Paleoeuropean. But here, for lack of Levant Neolithic, samples we see a different picture somehow. It's not like you will get final answers with any single autosomal analysis, you have to look at the questions from various angles, considering different complementary analyses with different sampling strategies, etc. and then maybe, if you can, try to build a synthesis that makes sense. Thanks Maju. As far as I can tell, the 'yellow' is also an Iranian N component. I don't believe it is Iran_N noise, as other groups share the same color. Similarly, you can also see a small unique component among AG3 (light green), which is sparsely distrbuted in across the Caucasus region. But what I was trying to suggest is that the small 'yellow' component, which is clearly centered around Iranians Neolithics, should actually be regrouped with the 'green' component as Iran_N. The CHG group and others carry minute amounts of it, but given it's sparcity among Iranian_N, that still makes it significant. Lazaridis 2016, rejected CHG as a founder population, but rather a later product of, predominately, Iranian Neolithics, but given the significantly higher Haplogroup diversities around Iran and Turkey (in particular J), I am more likely to uphold his view, and view CHG as a slightly later population which resulted from expansions from the Near East, sometime between the late LGM and the earliest phases of the Neolithic. Because nothing in genetics, archeology,or anthropology is otherwise suggesting there is a complete replacement of the people of the Iranian plateau by CHG groups. Actually, see supp. fig. 1 (extended Admixture analysis): https://www.biorxiv.org/content/biorxiv/suppl/2018/05/16/322347.DC1/322347-3.pdf ... the yellow component is consistently dominant among the Mala, which is an Indian tribe, i.e. should be akin to ASI or pre-Neolithic Indian (Paleoindian but do not confuse with Paleoamerind). So I can see more favorably their stand in favor of using CHG as reference instead of Iran-Neolithic, now that I have looked at the extended Admixture analysis, because the yellow component might indicate Paleoindian admixture among Zagros Neolithic peoples, that is effectively absent in CHG and proto-Indoeuropeans. More research is needed and I would not heavily lean in favor of either population being the source of proto-IE "green" admixture, probably there were other unsampled related populations involved as direct source instead. BTW Iran-Neolithic is not from "the Iranian plateau" but from the Zagros mountains, what we usually call Kurdistan. We don't know anything about the ancient genetics of Iran proper, which AFAIk appears in the archaeological record only after the Neolithic (proto-Elamites and their Eastern cousins of Jiroft, both in the southern regions and surely somehow intermediate with Baloch-Indian Neolithic). I'm not sure why you get the idea of anybody suggesting "a complete replacement of the people of the Iranian plateau by CHG groups". All we can say is that CHG and Iran-Neolithic (Zagros Neolithic, East Kurdistan Neolithic) were close relatives, as they still are relative to modern Iranians, Kurds and even Turks, although there seems to have been an increase of the orange component since Late Neolithic or Chalcolithic. Excellent. Thank You so much for bringing that to my attention. Yes, interestingly, it appears that Iranians possess some component that is common to South Indians. I wonder if that would be, is it actual admixture from India, or does it represent some ancestral trace which was shared between Iranians and ancient Indians before they split in the paleolithic? Also, in K22, in the extended analysis, it does actually reveal Iranian_NeolithicSG as bearing the 'green/teal' component, followed by Iran_Ganj_Dareh_Neolithic Iran_HotuIIIb Iran_HotuIIIb and CHG about equal amounts. Actually, I just noticed that WHG also carries that 'yellow' in some small but conspicuous quantity. So it's probably more likely that whatever of that specific yellow that is shared between Mala and Iranians and WHG, should technically not be assigned to "Mala". The same phenomena is also evident in WHG with a tinge of the 'Anatolian_N Orange' (see extended analysis). That specific orange in WHG, can probably be better explained as vestigal genes that are remnant of a very deep common ancester between anatolians and WHG, as the earliest populations moved into Europe through the Mediterranean route. Interesting what you say about WHG yellow. It's probably just some "noise" for all those populations having a common origin but then of course we can't disregard migrations and backmigrations that would be very hard to detect if not hegemonic. "And even then it can be confusing because the Proto-Vasconic or Anatolian Neolithic population was found in previous studies to be mostly a mix of Iran/Zagros Neolithic and Palestine/Levant Neolithic, with a very slight touch of Paleoeuropean. But here, for lack of Levant Neolithic, samples we see a different picture somehow." Nope.The most recent studies at Neolithic Anatolian samples show that they were largely descended from Paleolithic Anatolian. "Anatolia was home to some of the earliest farming communities. It has been long debated whether a migration of farming groups introduced agriculture to central Anatolia. Here, we report the first genome-wide data from a 15,000 year-old Anatolian hunter-gatherer and from seven Anatolian and Levantine early farmers. We find high genetic continuity between the hunter-gatherer and early farmers of Anatolia and detect two distinct incoming ancestries: an early Iranian/Caucasus related one and a later one linked to the ancient Levant. Finally, we observe a genetic link between southern Europe and the Near East predating 15,000 years ago that extends to central Europe during the post-last-glacial maximum period. Our results suggest a limited role of human migration in the emergence of agriculture in central Anatolia." 1. Is not "one" but at least two. 2. Is more recent than the one from Levant (PPNA/B) and the NE Zagros (several groups). There is very limited pre-Neolithic inhabitation known in Asia Minor. First quick read: it's suggestive of population continuity but I miss more clear data, like an Admixture analysis. Still interesting. "Is not "one" but at least two." Interesting,I have reviewed all Neolithic Anatolian data published so far.They were all exactly the same as the first Neolithic settlers in central Anatolia. If by "second community" you mean proto or early Neolithic societies like gobeklitepe in southeastern proviences of Turkey, they are already considered in PPNA/B culture,not Anatolian. Also Anatolian Neolithic was not more recent than Zagros or levant.PPNA and zagros began circa 9500BC Anatolian circa 8500 BC only 1000 years between than,not a long time for archeology and archeogenetic. Observe the limited point of sampling (extreme western fringe) for the "Anatolian" population. The same dubious type of conclusion came from an earlier study which I mentioned here on Maju's blog. However, a small sampling just a couple hundred miles East, and indeed, the Iranian Neolithic component shows. Of course, even further East in Anatolia, there will be more of any Iran_N component. Selective sampling is a convenient way of de-Easternizing the genetic influence from the East, but that's really just bad science. I meant that the South Anatolian Neolithic of Çatalhöyuk and such is clearly not the same culture as the one we see in the Aegean, even if they may be related somehow. As a thought experiment you could get a modern Irish and a modern Russian (or Hungarian or whatever within the big Northern European geneteic homogeneity blob) and find them genetically very close, but they are not the same culture and genetically they have remained pretty much isolate from each other since the late Chalcolithic for all we know. Just as word of caution, not saying it's the same thing but that I'm perplex that Anatolian Neolithic seems to have such a well defined personality since day one. Anyhow, is there any sample at all from Southern Anatolia? In the past it used to be the only productive area in terms of prehistory, yet I see that the oldest sample (Pinarbasi) is from NW Turkey. Not too Western but definitely not Southern Anatolian. This adds to perplexity even more. I did notice however that the CHG groups sampled were considerably older, including a 13,300 year old and 9,700 year old male from western Georgia, in the Caucasus. This is compared to the sample of Iranian Neolithics/Chalolithics, which combined (as you have done in your study) are, at least, 4000 years later than those samples. Without similarly dated samples from Iran, how would can we be sure about the direction of genetic influence? I know the geographic distance between the two sites between the Zagros and the Caucaus Mountains is very small, so do you think it's even possible, to accurately determine this, or should these groups be considered the same, for practical purposes? We would need older samples from the Zagros to know for sure. Hopefully more ancient DNA will come out of this region in the coming years.